In our near future. Over the weekend, A24 debut a mysterious teaser trailer for an untitled film - without any information or details about what it is or what it's for or anything. After some sneaky investigation, The Film Stage discovered that the trailer is actually for a short film playing at Sundance 2017 called Toru. 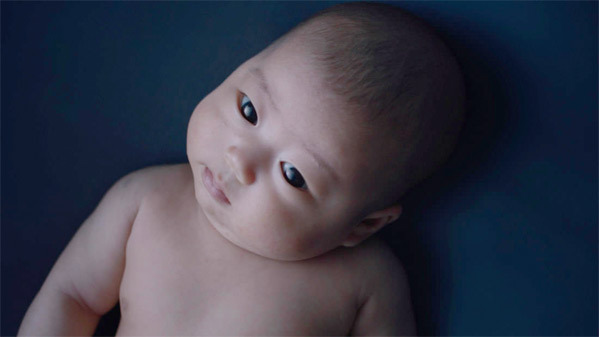 The footage has a sci-fi edge to it and shows the life of a baby living in a futuristic Japan. Early speculation was that this might be Shane Carruth's new sci-fi film, but apparently not. It's actually a very unique short about sci-fi tech that allows a baby to experience a full life in a matter of days. Some are speculating that maybe A24 is developing a feature, or just releasing the short, either way they've definitely got our attention. Full description via The Film Stage: "With a science fiction undercurrent, Toru centers on the story of a baby boy, named Toru, born with a fatal lung condition. As he only has a few days to live Toru's parents sign him up for a trial experiment that would simulate a full life in a matter of days. The film follows Toru's dream-like life simulation as a boy named Todd growing up in a New England suburb, and concludes in futuristic Japan." Toru is co-directed by Jonathan Minard and Scott Rashap, featuring cinematography by Matt Mitchell and a score by Brian McComber. It runs 14 minutes in Japanese with English subtitles. Toru is premiering at the 2017 Sundance Film Festival. Expect to hear more from A24 soon after. Thoughts? So the asian baby becomes a white man? Are you kidding me? More brainwashing of "white makes right". Jesus.